Hot tamales cinnamon candy. A bite size chewy candy with a spicy Cinnamon flavor. Sink your teeth in these hot tamales for cinnamon blast. 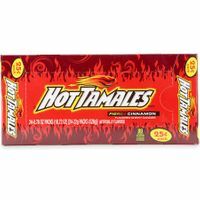 You get 24 .78 oz boxes of hot tamales per box.